Our next writer in residence is the Indonesian writer Reda Gaudiamo, who will be in Norwich in March 2019. Reda will visit local schools to celebrate World Book Day on Thursday 7th March. She will also take part in an event for children and families at the Millennium Library on Saturday 9th March. Reda Gaudiamo is a young adult short story writer who is also a nationally renowned singer, particularly of poems turned into songs. Her adult collection, Tentang Kital/About Us and chapter book for children, The Adventures of Na Willa, will be published in the UK by The Emma Press. 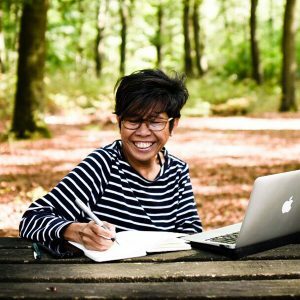 Later in March, Indonesian children’s writer Debby Lukito Goeyardi will return to Norwich for two weeks, to work with schools, the Puppet Theatre and the Millennium Library on a series of storytelling and craft workshops for children and families. Debby visited Norwich in 2017 with the support of Indonesia’s National Book Committee. You read about her visit here. These residencies are in partnership with the British Council as part of the Indonesia Market Focus at The London Book Fair 2019. In April 2019, we will welcome the Flemish writer Kathleen Vereecken to Norwich for a month. Kathleen has worked as a freelance journalist for several papers and magazines. She has written historical novels for young adults, books for children, and her first novel for adults was published in 2016. Her work has been translated into French, German and Italian. This residency is part of an exchange with the Passa Porta House of Literature in Belgium, supported by the Flemish Literature Fund. Later in the year, UK writer Katie Hale will head to Brussels for a residency at Passa Porta. 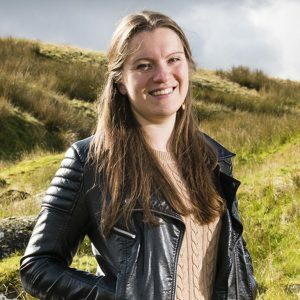 Born in Cumbria, Katie’s poetry pamphlet, Breaking the Surface, was published by Flipped Eye in 2017. 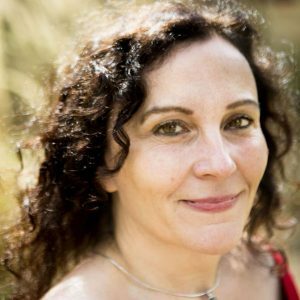 She recently won the Buzzwords Poetry Prize, the Jane Martin Poetry Prize and the Ware Poetry Prize, and was shortlisted for the University of Canberra Vice Chancellor’s International Poetry Prize and the Ballymaloe International Poetry Prize. Her poetry has been published in Poetry Review, The North and Interpreter’s House, among others. In 2017, Katie was mentored by Penguin Random House on their inaugural WriteNow scheme. Her debut novel, My Name is Monster, is due from Canongate in June 2019. Katie is writing a collection of poetry exploring the ways in which our identity is shaped by those who come before us. She says: ‘The poems particularly examine different aspects of cultural heritage, the parts we celebrate alongside what we choose to forget.